I'm really enjoying the Nduja salami I made at the start of this year, but as it's so rich and fatty I've had some diminishing returns when enjoying it plain with bread and pickled red onions. Don't get me wrong, it tastes great...but a little goes a long way. 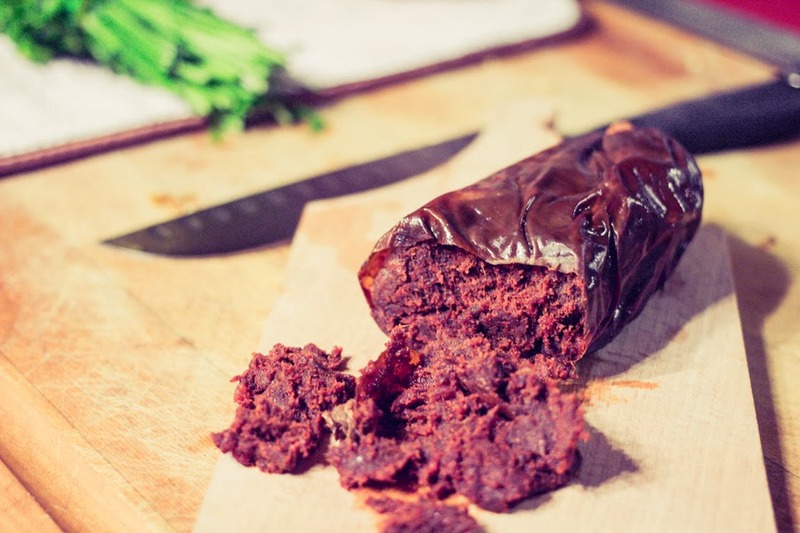 Reading about other uses for Nduja salami, I found some cooks, chefs, and home charcuteriers use it to make a sauce for anything from pasta to grilled meat. It makes sense; at 33% fat, 33% meat, and 33% various spices, Nduja is pretty much a highly concentrated paste of salami goodness. Nduja hails from the coastal region of Calabria, so I thought a seafood dish would be perfect. 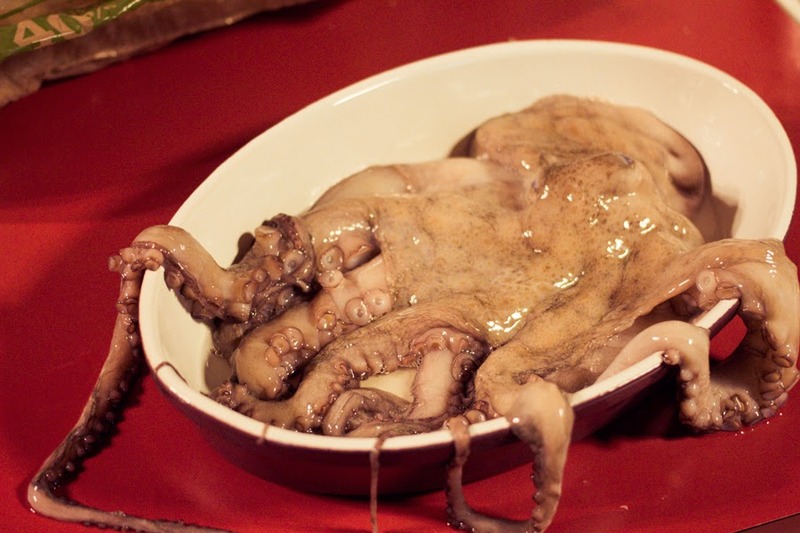 Originally I wanted to do clams and some sort of hearty green, but I came across a Spanish octopus that looked great. Plus the meaty texture of octopus should be a good match for the intense flavors of the Nduja. In my previous reading, people would loosen up the dense Nduja paste with some stock or pasta water. Sadly I was fresh out of octopus stock, so I added about 1/2 cup of Nduja to sauteed onions, carrots, and red pepper, then added a half cup of dry white vermouth. Stirring the mixture about, the fat in the salami soon warmed and began coating the rest of the ingredients with a glossy red sheen. 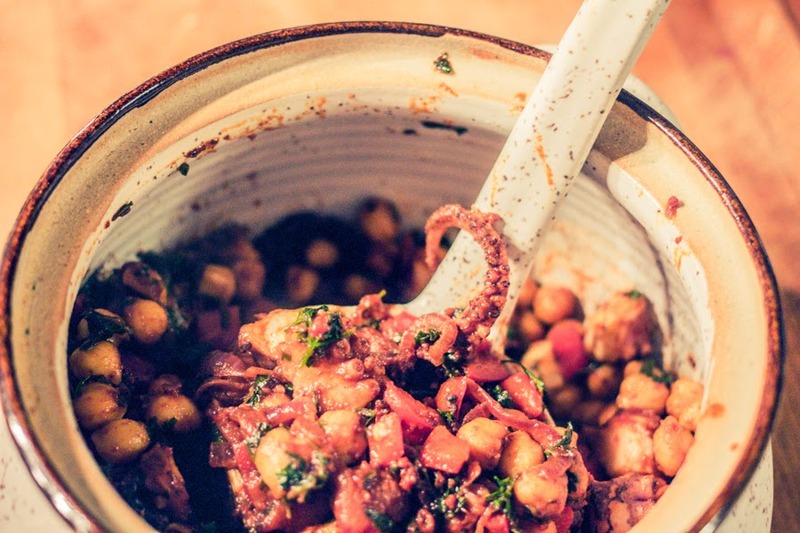 Next I added a large can of rinsed chickpeas and the (previously boiled and chopped) octopus to warm through. The resulting recipe tasted more Spanish than Italian, but still very tasty. I really enjoyed the intense flavor of the Nduja, which was even more pronounced when hot, compared to eating the salami plain at room temperature. The final flavor of the dish also enjoyed a good boost of flavor from the cured pork in the Nduja, which enveloped the entire dish with a rich savor.